WELL, the March Newsletter is appearing in April again - apologies. There never seem to be enough hours in the day, and, as you can read inside, not only have we had a busy year in 2003 (A.G.M. report on page 2), but 2004 is as busy as ever as well, with Crox Bottom (page 5) and Living Rivers (page 6). One excellent event coming out of the Living Rivers initiative is the Malago Trek, repeated this year on 23 May - a flyer is enclosed. Another activity which has taken a fair amount of time recently is a very welcome one. We always enjoy working with local schools, and we are now co-operating with Kirsty Wilson, the Schools Grounds Project Worker at CSV Environment, on a scheme at St Pius X School. Using a 'Greenworks' grant, the school has had some unpleasant hawthorn bushes removed and a willow sculpture has just been completed in their place which will give the children something much safer and more interesting to play in. The willow-weaving was done by a professional worker with help from Don Bartlett (who has done a similar scheme at the Millennium Green) and me. The next Newsletter should have some photos. Over the coming months we will work with Kirsty and the school on bird-boxes, with more planting to encourage wildlife in the autumn. The good weather as I write, the wildlife report on page 6, and the events on page 7 all go to prove that summer is here. That also means holidays, so please note that the M.V.C.G. can-sorting depot at 14 Queens Road will be closed for staff holidays from 10-24 April! AS USUAL, we include in the March Newsletter a summary of what was reported at our A.G.M., held this year on 17 February. After the formal business, Julian Cox explained his role as Community Park Manager, and Rachel Schofield told us about the plans for the new Withywood Centre. Programme Report: Lola Hardingham reported on the full and varied programme held last year. Wendy Green gave a good talk on the wildlife work of the RSPCA, and Jane Bickerstaffe of the Industry Council for Packaging and the Environment came from London to talk about the amount and types of packaging. During the summer there were visits to Emmaus House Gardens, Clifton, and the Redding Pits which were very well attended. There was the Malago Trek and a tour of the Millennium Green. In the winter Kathy Derrick spoke about our rivers and Eleanor Davis gave an interesting talk on her visit to a remote part of Madagascar. 'Christmas at Home' was well attended again and enjoyed by all, as was the Christmas Party. Last month Marian Green talked about the uses of local plants. 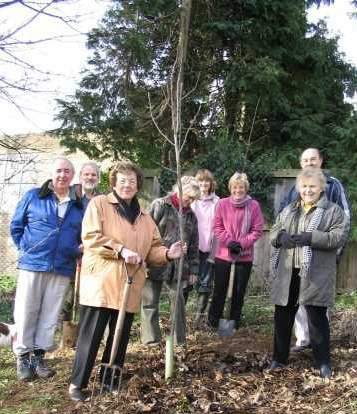 Lola also thanked members for their support in planting bulbs, making coffee and generally supporting M.V.C.G. Planning Matters: André Coutanche said that we ended 2002 with the planning application at the Old Vicarage, Bishopsworth, for seven new houses being rightly refused, but we expected that the developers would appeal. They did, and although the appeal was dismissed, the Planning Inspector indicated that a much more modest development of a couple of bungalows would have been allowed. Not surprisingly, the developers made such an application. Our view was that it was indeed acceptable considered in isolation, but if it was granted planning permission, it must be the final development at the Old Vicarage. The application is still pending. Also still pending is the Park & Ride scheme on Bedminster Down, which we and many other people opposed. It may be fading away, but we aren't counting any chickens! Another pending planning application is the development of Highridge Playing Fields. We had misgivings about several aspects of the scheme and said so to the Council's Development Control Committee. The application was granted planning permission but with a list of items to be decided later; no work could be done until these details were consulted on and decided. Nothing has happened since then, and we are not aware of when anything might happen. Another item left in limbo at the end of last year was the proposed link road between the A38, Bridgwater Road, and the A370, Long Ashton by-pass. North Somerset Council chose the 'orange' route, which we supported, but the Government Office of the South West would not allow them to proceed until a general review of road schemes around Bristol had been done. This is still pending. Also on roads, we reported last year that the former line of the Ring Road from Cater Road, through Withywood, up King Georges Road and across Highridge Common, was being shown in the Alterations to the Bristol Local Plan as still an option even though it had been removed from the Structure Plan. We put in a formal objection to the Local Plan on that basis, and we are waiting to hear how this and other objections will be handled. We were told during 2003 that planning applications were 'imminent' for Symes Avenue, for Hartcliffe Community Campus and for the Wills Office Block. One imminent application is now really happening, at Bedminster Down School, which was passed at the Development Control Committee last Wednesday. Another one is what dear Geoff Cargill told us about at our last A.G.M. - the redevelopment of a new Church Centre on Queens Road to replace Withywood Church. A recurring theme in 2003 - and in 2002 and in 2001 - was mobile phone masts. We unsuccessfully opposed a couple during the year, but a pattern now seems to be emerging whereby it is possible to oppose a phone mast successfully, provided it is on strong grounds of visual amenity. In our area, clusters of masts seem to be developing at Cater Road, which is not unreasonable on an industrial site, and at the Rising Sun, which isn't so good. 2003 also saw the demolition of the Mendip Gate and a subsequent application to redevelop the site with houses and flats. We had no objection to the use - though we weren't over-impressed with the street frontage - and permission was given. There were three planning applications last year which were unexpected and turned out to be rather controversial. At Pentire Avenue, there was an application to build a block of six flats. We liked the architecture but the scheme was over intensive, and after a long debate at the D.C. Committee it was refused. The developers appealed, and we heard recently that the appeal had been dismissed for the interesting reason that cars parking for the flats would inevitably spill into Pentire Avenue to the detriment of the residents' amenity. It could be an interesting precedent. The former Esso petrol station on Bishopsworth Road had an interesting planning application for a block of flats. We were initially surprised that it was being built on part of what we had assumed was Manor Woods, but this was in fact privately owned land. We quite liked the design which respected the building line along Bishopsworth Road and the heights of the neighbouring houses but our primary concern was the impact on Manor Woods. The developers were keen to talk to us and their landscape consultant asked for our suggestions. The application was refused because it would have been built on land which, while privately owned, was identified as open space in the Local Plan. The developers announced they would appeal, though in the event they didn't, but they did put in an almost identical planning application which was pending at the year-end. At the 'Marpets' shop in Highridge Road there was an application to replace it with a developments of flats with two shops on the ground floor. The proposal was much too tall and out of keeping, and there were concerns about parking and access. This was our first contact with the new South Bristol Co-ordinator in Development Control, Julie Tritton, who helpfully sent us a copy of the plans. The application was withdrawn and we have sent Julie a copy of our 'Elm Tree corner' report so that if another, suitable, scheme comes up, we can try to incorporate aspects of our ideas for improvement. Progress with Projects: Mary Sykes said that litter clearances continued as before on the last Monday of the month at 3.45pm at various venues around BS13 from Manor Woods and Withywood Park to Fulford Road and poor sad Symes Avenue. In one hour we usually collect a trolley load of litter. We also continued our annual amphibious garbage raid when we tackle the Malago in Manor Woods. Everyone is welcome! One of the things we do on garbage raids is separate and save aluminium cans. We also collect cans from other sources and have a number of diligent collectors. These are sorted by Marie Jo, to whom we are indebted, and sold. From the accounts you will see we raised £106.20 last year. At 40p per kilo this represents an enormous number of cans. The money from the cans goes to buy bulbs, usually daffodils, which we plant around the area to make a welcome splash of colour at this time of year. Last autumn we planted a 1000 or so at the green by St Oswald's Church but the spread on the corner by Bishopsworth Library which are now on their third spring has been very enjoyable too. 2003 saw the completion of the 'Urban Natures' study about the importance of open spaces in Birmingham and Bristol. André and Beryl went to a presentation in Birmingham and there is a DVD and video featuring several members talking about Manor Woods and extracting bikes from the Malago. We have recently started a new project helping St Pius X School to improve their grounds and plant a wildlife friendly garden for the pupils. Plans have been drawn up and construction and planting will start shortly. We also completed a similar project at Highridge Infant School which we started last year. There are two projects have not progressed as we would have wished during the year. These are at Elm Tree Corner, where we have long standing ideas to improve this area but as we have been unable to engage the interest of any of the City's traffic engineers whose assistance and co-operation is required, this enterprise remains a dream. And at Manor Woods, we have not made progress with the management plan which we agreed with Richard Ennion of the City Council. CROX BOTTOM has been attracting a lot of attention in recent months, not all of it welcome. We reported in the November Newsletter that the City Council's Cycling Team intended to widen the path down through Crox Bottom to 3 metres. We didn't see why this was necessary and we wrote to oppose it because of the visual intrusion. We also met cycling officers at meetings of Community Networks and the Environmental Forum. I regret to have to say that we have not been impressed by their approach. Members and friends of M.V.C.G. will not need reminding that our policy is always to seek dialogue with the Council, but this was impossible in this case. Every point we and others made about a sensitive environment, visual intrusion, appropriateness to the context and a balanced approach was met with apparent incomprehension and an unswerving adherence to engineering standards. The worthy aim of improving facilities for cyclists seems to operate in isolation and with indifference to wider considerations. The Council's Cycling Team - based on our experience in this case - constitute a positive threat to the environment. A compromise of sorts has been reached. We have been told that the path width will now be 2.75 metres. This follows internal discussion within the Department of Environment, Transport and Leisure - opposition to the 3 metres didn't come just from local groups but also from several sections within the Council. It remains to be seen whether this decision is final. 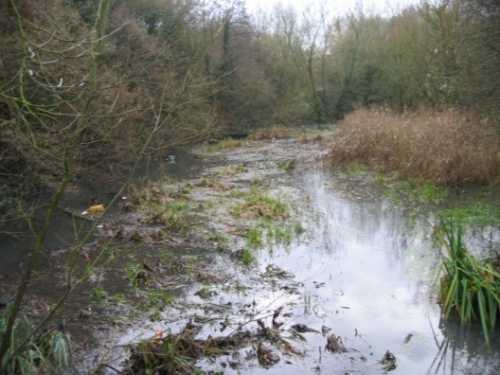 On a much happier note, Keith Way, a local resident, organised a clean-up for the pond area in Crox Bottom, using a 'Greenworks' grant to employ Hartwood Enterprises and with volunteers, including from M.V.C.G. Keith is now trying to organise a 'FRIENDS OF CROX BOTTOM' group, which we would welcome and support. If you are interested, ring me on 964 3106. The lower lake before clean-up - it looks better now! THE LIVING RIVERS OF SOUTH BRISTOL event which was cancelled last November was held on Saturday 27 March at the Southville Centre and was very well attended by almost 50 people. Although from different walks of life, it soon became apparent we all had one aim - to clean up and keep alive our precious waterways from the hills. Ben Barker from the Southville Community Development Association and Kathy Derrick from the City Council who runs the 'Living Rivers' initiative explained the procedure and we then had three short talks from Steve Lawrence, the Council's Drainage Engineer, Glyn Sewell of the Environment Agency, and Julian Cox, the Council's Community Park Manager for south west Bristol. We split into six groups for discussions on important issues, such as rubbish clearance; awareness of what rivers and streams can offer wildlife and the public; co-operation between groups and statutory bodies etc. Ideas and opinions were written down on large sheets of paper from each group and stuck on the wall for everyone to digest whilst having a coffee break. After this, the Malago/Pigeonhouse and the New Cut were discussed separately in groups and the meeting finished at 12.30 - with a free lunch! It was a very well organised, friendly and worthwhile meeting. We all hope it leads to some positive action. MORE INTERESTING AND SURPRISING sightings from around our patch, this time from Angela James, Keith Way and Marie Jo Coutanche. At Crox Bottom on 16 March there were seven newly-hatched TORTOISESHELL BUTTERFLIES frolicking over four newly-opened dandelions ... and then a beautiful big yellow BRIMSTONE butterfly like a leaf dancing in the wind! Bye bye, winter! On the Mounds at the end of March, a BARN OWL flew past in broad daylight! In Crox Bottom on 28 March, there were TEAL, one male and two female. Also four BUZZARDS soaring over site. A SPARROW HAWK has been seen in our Bishopsworth garden - as has suspicious evidence in the form of piles of feathers! IT'S SUMMER! And with fingers crossed, summery events are on offer from M.V.C.G. and other organisations. As usual, M.V.C.G. 's own events are marked with a .
Monday 26 April: Garbage Raid at 3.45pm. Meet at Fulford Road, Hartcliffe. Saturday 15 May: Fun Day at the Millennium Green, 12.00 - 4.00pm. See below. Sunday 23 May: The second Malago Trek. See the enclosed flyer. If you'd like to help for an hour or so on the day by showing walkers which way to go, please ring André on 964 3106. Monday 24 May: Garbage Raid at 3.45pm. Meet at the junction of Fernsteed Road and Church Road, Bishopsworth. Thursday 27 May: Walk on Highridge Common to look at the wild flowers, including, if we're lucky, orchids. BARBRA LAKIN will be our guide, meeting at 7.00pm opposite Cox's Garage. The FRIENDS OF THE MILLENNIUM GREEN are holding a fun day on 15 May on the Campus green (Bishport Avenue, Hartcliffe, near the City of Bristol College) between 12.00 noon and 4.00pm. There will be a bouncy castle, Bristol Zoo encounters show, and a falconer bringing birds of prey with a display. There will also be skittles, green woodworking, inflatable pole joust, kite making, and a football tournament organised by the South Bristol Boys Club, plus a raffle with some very good prizes. Further, there will also be a pet competition, sumo suit wrestling (should be good fun! ), fitness testing machine and a tug-of-war competition. The River of Life Christian Centre will be providing refreshments. We are really short of volunteers and if anyone can help please ring Rachel on (0117) 377 6232. IN THE July 2003 Newsletter we announced that M.V.C.G. 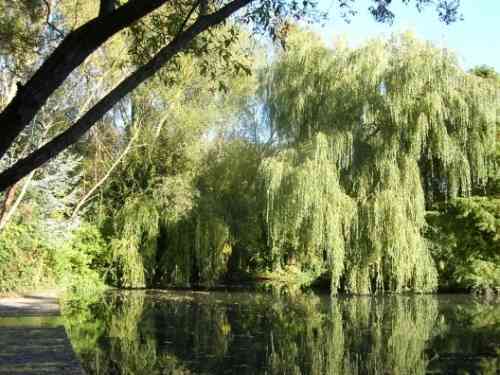 would be planting a tree in memory of Jack Price. 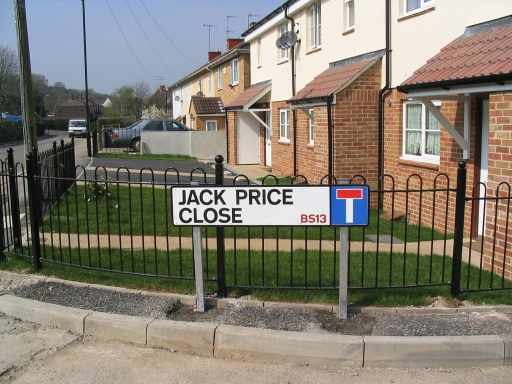 And in the November Newsletter, we reported that the City Council would be naming a new close in Hartcliffe after Jack. The tree was planted in Manor Woods on 9 February, and the new road signs have just appeared off Pawlett Road. Tania Case, Valerie Gay, Paul Mizen, Ted Thomas, Sue Walker, CSV Environment, Cllrs Mark Brain, Peter Crispin, Richard Eddy, Ron Hodges, Helen Holland, Colin Smith, Mary Sykes (All the City councillors for Bishopsworth, Hartcliffe and Whitchurch Park wards are invited to become co-opted Committee members).